BMW V8 engines aren't as well catered-for as other favorite european 4 & 6 cylinder motors in terms of available tuning parts in the UK. Things are a bit better in Germany & the States. Most BMW-specific tuning companies focused on the more popular M3 6-cyl engines and sold few parts for the V8s in europe. Also these engines are seen as too complex to tune, which in the case of the later Vanos-equipped versions is partly true. Which is a shame because apart from a few poor design features like the oil canister drain valve and the nikasil bore problems, the design has excellent tuning potential. 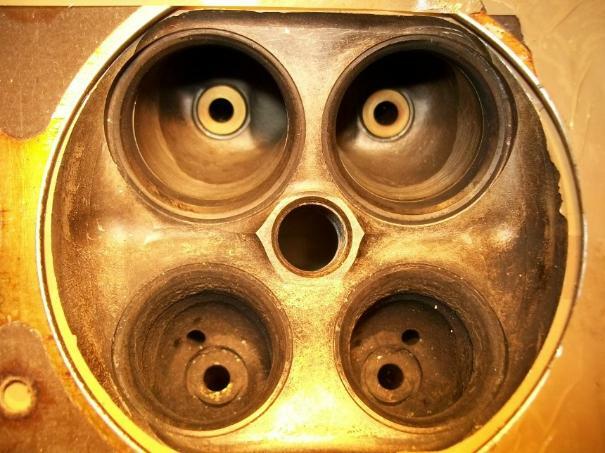 The valves are bigger than any commonly tuned 16-valve 4-pot, and could support up to 120bhp/L if the cam lift/duration and intake/exhaust path was redesigned accordingly. After BMW introduced the original M60 V8 in 1992, it was quickly replaced by the M62 in early '96. 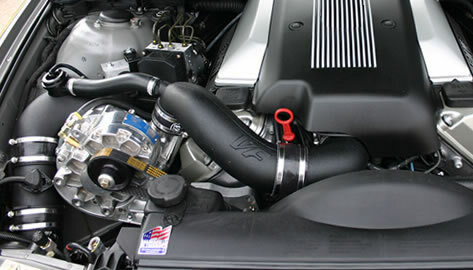 The M62 is favorable for tuning because of it's larger 4.4L capacity, but it also has softer cams and a more restrictive plenum arrangement than the M60, the later M62TUB engines are equipped with the Vanos variable cam timing, which although clever can pose a problem for conversions if you move away from the Bosch ECU and want to find an aftermarket ECU that can control the system accurately. The main difference between the M60 and M62 is the timing chain arrangement which changed from double row main chains with a central idler sprocket to a single main chain with a curved central guide. 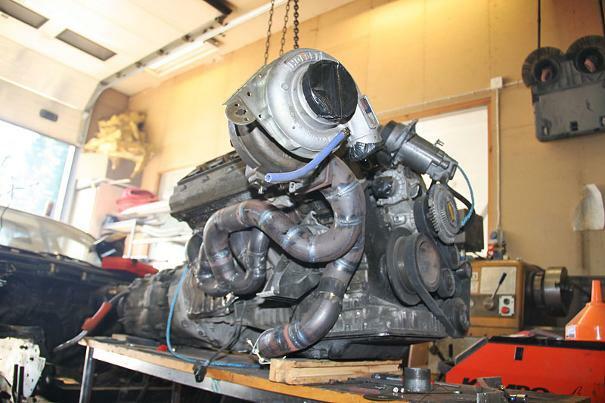 De-catted M62s with re-mapped ECU and improved manifolds have shown up to 340bhp. There are still a few brands of tuning chip around for the early 404 Bosch ECUs, the Dinan and AC Schnitzer ones, and Wokke_2000. Up to 15% power gain claimed but rarely a genuine dyno printout around to prove it. The M62 manifold has slightly narrower intake runners than the earlier M60 as it was re-designed to give increased midrange torque. 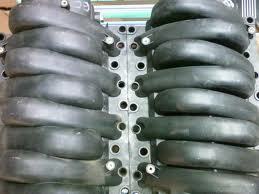 Some have found that fitting the M62 with the larger M60 manifold will imrove the top end power. Fatter runners can be seen on the M60 unit on the left. 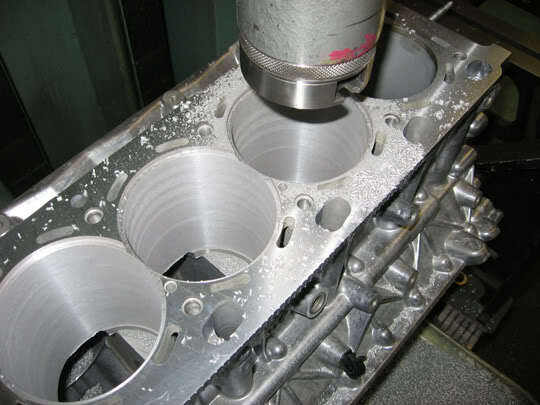 The downside of the conventional tuning methods of fitting a shorter & wider inlet tract and big cams is that generally torque below 4500rpm is reduced. 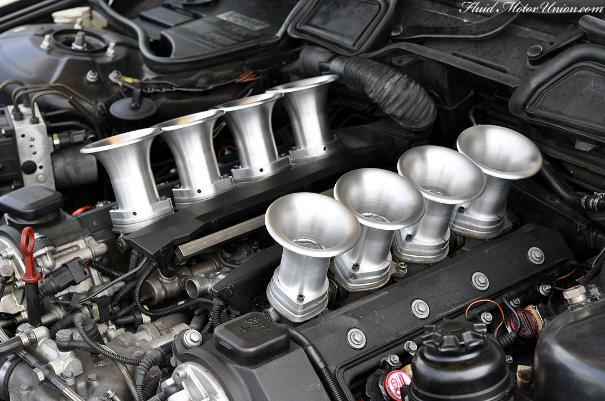 That's where supercharging and turbocharging have become very popular with tuners in the last 10 years or so. With DIY programmable mapped fuelling and ignition control it's possible to cater for big jumps to positive manifold pressure that was never before possible with carburettors. Modern turbocharger and wastegate design allows a well-chosen turbo to generate boost from far lower rpm than previously possible. Although fitting it all into an already tight engine bay could be tricky. This vid by Spenna Motorsport in Germany shows a twin turbo race setup being tested on an axle dynamometer. 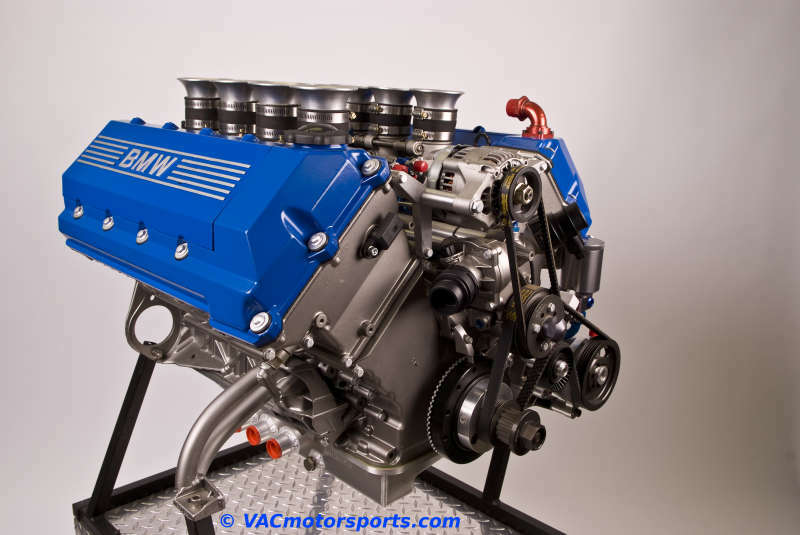 ESS-Tuning and VF Engineering offer centrifugal blower kits for the M60/62, both using the Vortech V3 blower. These comprehensive kits provide larger injectors, all pipework, belt, pulleys and remapped ECU chip. Not cheap but 410bhp is an impressive gain for a 7psi boost on an otherwise stock engine. Given the space limitations in most conversions, a single Garrett GT35/GT40 could be a good turbo choice and should spool fairly quickly. Similar sized turbo fitments on the smaller capacity M52/S52 straight-6 have given very good results. Most of the aftermarket centrifugal kits don't blow over 7psi to avoid detonation with the standard compression ratio. 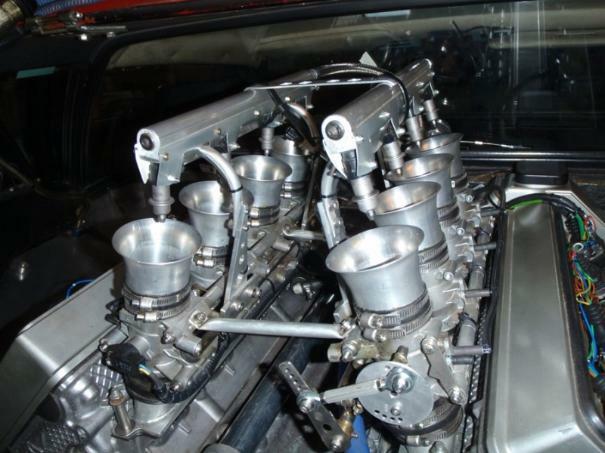 A high boost turbo setup or Rootes/Lysholm supercharger would ideally need forged pistons with a lower CR. 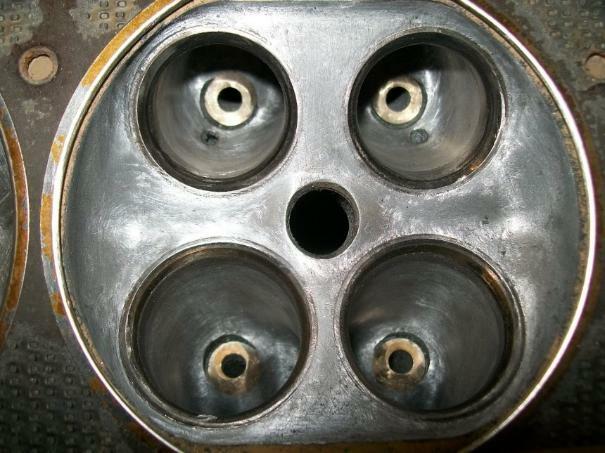 The valve sizes and position are identical on the M60/62 and S62. But the S62 had around 0.6mm greater valve lift. Which shows that basic design is very good as the S62 is making 400bhp from a similar head. On my M60 head shown here, i made some improvements to remove valve shrouding where the combustion chamber wall is tight to the edge of the valve, and to take off the lip at the edge of the valve seat insert fitting. 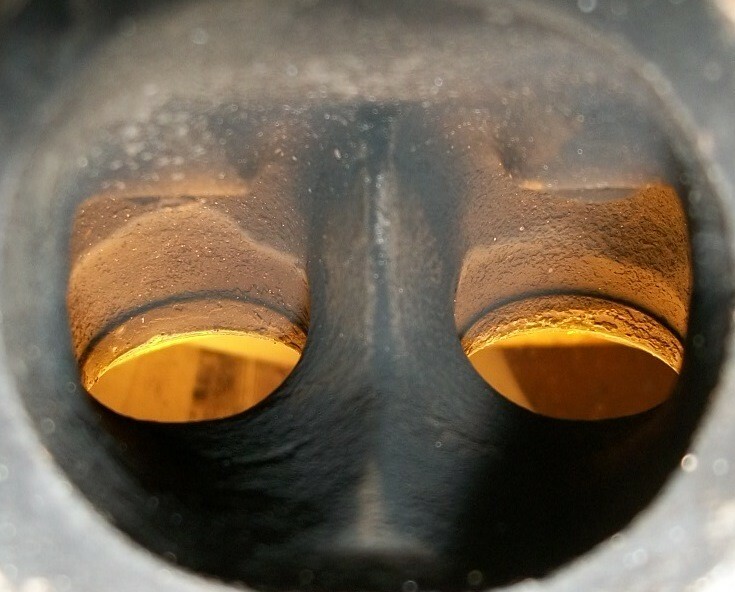 There are also some improvements that can be made in the ports, mainly rounding off the cast lumps around the valve guide nose, and smoothing out the sharp lip at the back of the valve seat insert. 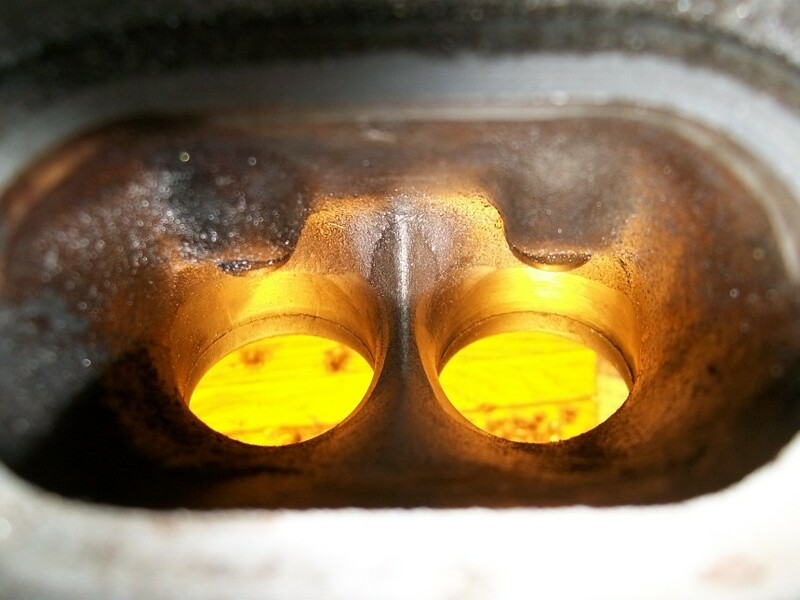 With all 16 ports treated in the same manner there should be an overall flow increase, especially when combined with a better exhaust manifold design and system. 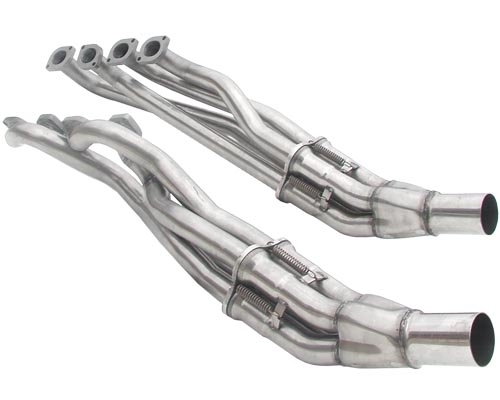 Exhaust design has a big part to play and the standard 540i/740i manifolds are a space-saving design made from pressed steel panels with some kinks and flattened sections that can be improved on. The firing order on the M60/62 is 1-5-4-8-6-3-7-2 with cylinders numbered 1-4 from front to rear of the LH bank, and 5-8 from front to rear of the RH bank. On the LH bank BMW connects 1&3 and 2&4, and on the RH bank, 5&6 and 7&8 with very long secondaries pairing back near the gearbox. These pairs all have 270 degree firing intervals, and although not perfect it is at least an even connection of intervals. The main scavenging assistance comes from the secondary merger by the gearbox, where the long secondary length is tuned to the 270 degree interval so that the gasses from one cylinder are passing the the merger just as an exhaust valve is opening down one of the other primaries. And so given the space restrictions it's designed to give better midrange torque than any other feasible configuration. For torque gains over 6000rpm, a 4-1 resonance system would be the thing. 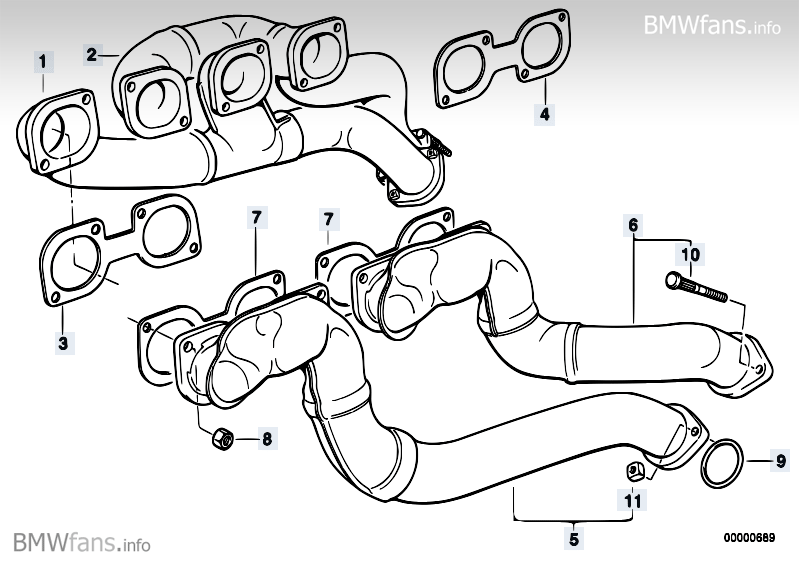 But interestingly the 400bhp S62 in the E39 M5 uses a system of manifolds almost identical to the M60/62 and peaks at 6600rpm. They are certainly one of the first things to change in the quest for increased torque above 5000rpm. The manifolds i made up for fitting the M60 in the Capri were still compromised by a lack of space but i hoped they'd be an improvement over the standard design. The pairings are kept the same as the original design. 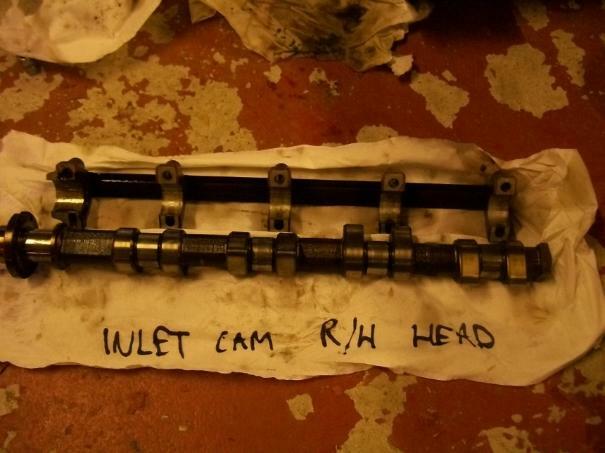 Dinan also did a very nicely designed set of equal-length 4-1 manifolds for the M62/S62 E39 but they weren't cheap! Given the high price of aftermarket manifolds i think it makes sense to make your own if the engine is going into a different shell. The standard M60 cams have 9.7mm lift on the inlet and 246 degree duration, exhaust cam is 9.4mm lift and 242 duration. Cat cams sell a good range of different grinds for the M60, with up to 284 duration and 11.5mm lift on the biggest hydraulic follower cam. And then solid lifter race cams all the way up to 305 duration and 13mm lift. 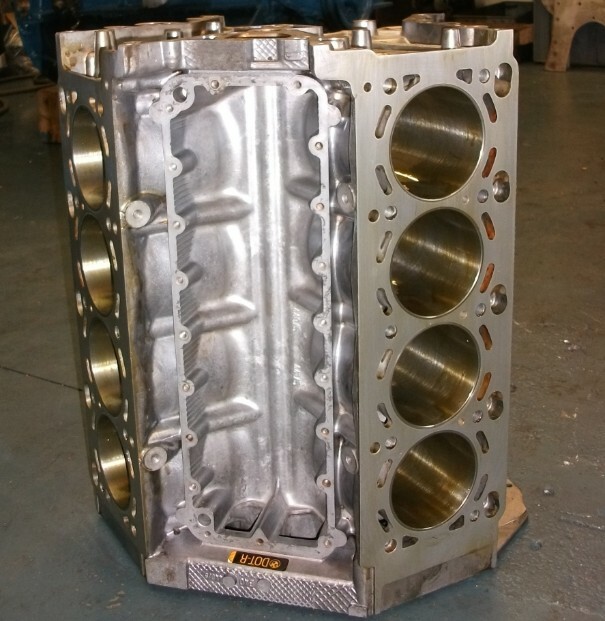 VacMotorsports also do a range M60/62 cams. Neither are cheap. The main headache with the Nikasil and Alusil bores used in all the BMW V8s is that they cannot be rebored in the way that conventional iron blocks or iron liners can. 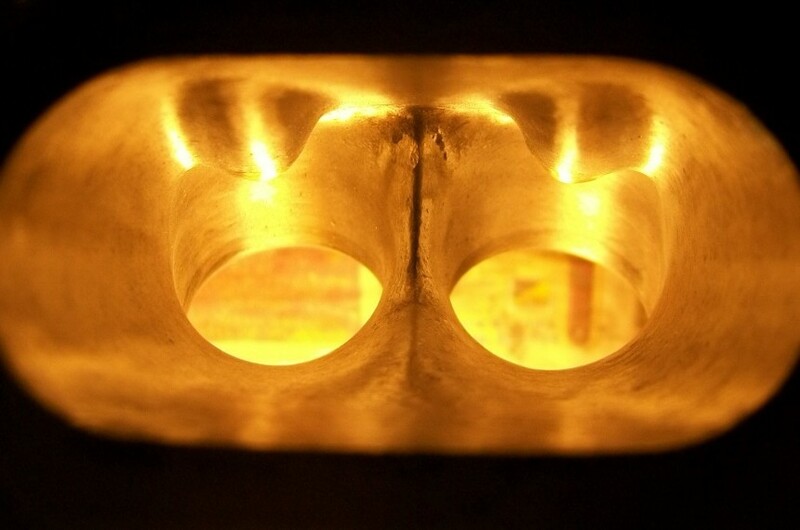 Alusil bores can be re-honed if enough of the exposed silicon is left, or there are specialist companies that can re-apply a nikasil bore coating. 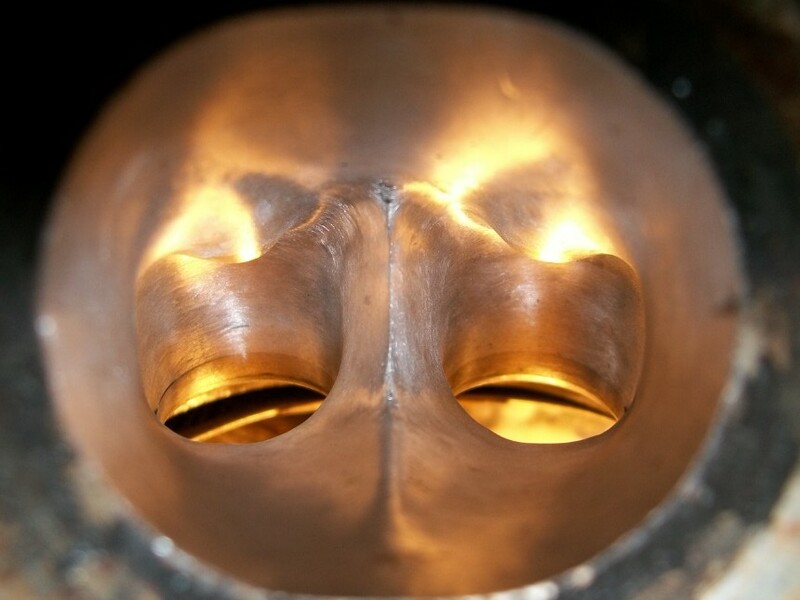 For competition work no suitable forged pistons are available to suit the alusil/nikasil bore surfaces so most racers go straight for a liner arrangement. Pistons for the M60/62 seem hard to get hold of in the uk, in standard design or aftermarked types. Vacmotorsports in Philadelphia has a good range of race-orientated pistons from CP and Wiseco but they are all designed to run in iron (i.e. you need liners). The original piston part numbers for alusil and nikasil blocks is listed in Mahle's online catalogue but not available from any UK dealers. And if they were available the price would probably be the same as a set of forged pistons. Parts availability and cost seems to be the main problem with rebuilding and tuning the M60/M62. It's a great engine design, but bearing shells and full gasket sets are expensive, and the availability on some other parts is non-existent. Fortunately there are a lot of old motors floating around Ebay and scrapyards so 2nd hand parts are plentiful.